A group of Georgian trick riders, photographed around 1903. They were first-class horsemen from humble roots who left what was then a far-flung corner of the Russian Empire more than a century ago to perform in the United States. Their influence on Western riding culture has proved enduring. A new book by author and documentary film-maker Irakli Makharadze chronicles the remarkable life journey of these proud men from Georgia, in the Caucasus region of Eurasia, at the crossroads of Western Asia. For 30 years, these trick riders, mostly from Guria, in western Georgia, performed in the US, becoming a central attraction in Buffalo Bill’s Wild West shows. “I had known about Gurian-Georgian riders from my childhood,” explains Makharadze. Makharadze’s book, Georgian Trick Riders in American Wild West Shows, 1890s-1920s, details how the riders were first recruited from Guria in 1892, when they joined the show, Buffalo Bill’s Wild West, in England. In 1891, a life-long circus performer named Thomas Oliver had arrived in Georgia. His mission was to find and recruit able horse riders for the Wild West shows. He was told that Guria was the best place to look. Oliver found the region literally packed with the first-class riders. Soon, with the help of some big-name local riders, among them Ivane Makharadze, the first group of Georgians were recruited and shipped to America for further training. Most Georgian horsemen – men and women – had never been out of country for they were poor peasants constantly in search of side jobs. Trick riding in the popular American Wild West shows provided a decent chance to improve their financial position. The American employers paid quite good money, up to $US40 to $US50 a month. The Georgian newspaper, Tsnobis Purtsely, reported: “They are paid 100 rubles per month and are given a wonderful chance to see the world.” To put that in perspective, the price of a cow in Georgia in those days was 3-5 rubles. The United States proved to be a challenge for the riders. Makharadze said they faced a language barrier and a culture that was alien to them. They also had an identity problem, with the show’s promoters billing them as “Russian Cossacks”. They knew it was just a publicity stunt, but the Georgians had troubling reconciling the idea that they had to perform under the usurper empire’s flag. Their homeland was part of the Russian Empire at that time, with the Czar having annexed Georgia in 1801. Soviet Russia did the same thing in 1921. Until their overseas adventure, most of the riders had never even traveled outside their native villages and had not even been to their country’s capital, Tbilisi. Makharadze said they were impressed by the Western world, especially so the US. Georgia Barbale Imnadze was among the Georgian showmen. Rider Kirile Khoperia reported back home that they were living in “very tall buildings” and got to their floor by tiny “moving rooms” (elevators). He mentioned the unusual clearness and order in the streets. Another rider, Giorgi Chkhaidze, told his relatives that Chicago streets were cleaned and buffed every single morning. The Gurian men struggled hard to cling to their roots as their performances grew to became the most spectacular part of the Wild West shows. Their fans came to include Queen Victoria, Woodrow Wilson and Theodore Roosevelt. Roosevelt attended a show in Chicago and was so fascinated by Giorgi Chkaidze’s performance that he presented him with a golden ring and a tray as a token of his esteem. The Georgians’ riding style, called dzhigitovka – a Turkic word taken to mean skillful and courageous rider – or jiriti in Georgian, changed the whole concept of trick riding. Georgia Giorgi Chkhaidze so impressed Theodore Roosevelt with his riding that he presented him with a tray and ring. Makharadze said Brown traced a link to the Georgian trick riders that is still found today. Brown noted that colorful costumes were a hallmark of trick riding. It was quite possible, he said, that the “outlandish western garb” that appeared on the rodeo circuit was a legacy of the Cossacks and trick riders. The Wild West program didn’t change much over the years, Makharadze said. Georgians rode in the arena five times each show. They first rode in the Grand Entree, and their second entry was a race between Cossacks, Indians, cowboys and Mexicans. Their third event was to give a 10-minute performance of native song, dance, and riding. Before the end of the show, they took part in the hippodrome races and the final salute. The total time in the arena was about 15 minutes twice a day, as well as participation in the daily parade. They performed the most unbelievable stunts while galloping, which pulled in paying spectators. At full gallop they could stand on their heads or stand straight up in the saddle. They would swing themselves parallel with their horses’ sides, ride three or four horses simultaneously, dive under their horses’ sides, jump to the ground and then back, ride backwards, and pick up stones, whips, a handkerchief, hat, rifle and other objects from the ground. Some of the Georgian riders did not return to Georgia. They started families and melted into the American “pot”, Makharadze said. Georgia Serapion Imnadze during one of his performances. Some of the men, such as Luka Chkhartishvili and his troupe, were forced to return to Georgia during World War 1. Others chose to return to their homeland after the war. Those who did return home were in for hard times as Georgia was experiencing radical political and social change. Many Georgian Cossacks were imprisoned or exiled by the Bolsheviks on the grounds that they were American spies. Some committed suicide to avoid such treatment. Other riders destroyed all photographs and mementos from their trips abroad in order to survive the tough new regime. Some riders were forced to sign documents that assured they would never mention America or Western Europe again. Any precious gifts that were found by the Bolsheviks were confiscated and supposedly destroyed. However, some of these items later resurfaced in the homes of those staunch members of the Communist party who had prosecuted the Cossack riders of the Wild West shows. 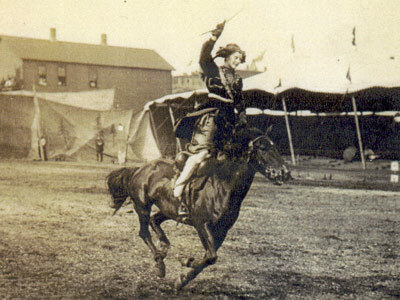 Georgian trick riders who performed for Buffalo Bill and other American showmen for more than 30 years, might be viewed as the first Georgian ambassadors to the US. To this day, the connection between Buffalo Bill and Georgian trick riders represents one of the oldest known relationships between Georgia and the US. Makharadze, from Tbilisi, graduated from the Tbilisi State Film and Theater Institute and has been working in the film industry for thirty years. He has produced several documentary films, including Riders of the Wild West and Rough Riders. He has written several books, including Wild West Georgians. Gurian Outlaws, Russian-Georgian Terror 1880-1924, Fistful of Westerns, and the History of Georgian Silent Film. His articles on film and history have been published in various Georgian and American magazines. Georgian Trick Riders in American Wild West Shows, 1890s-1920s, by Irakli Makharadze, is available in paperback and on kindle. It can be found on Amazon here. Georgian trick riders pose with American performers in one of the Wild West shows.